I got this a couple of years ago, in my early beauty awakening days when I was all starry-eyed about makeup. Unfortunately, newer additions to my makeup collection pushed this Convertible Eye Color further and further into the back of my drawer. This versatile, dual-ended eye color wand is a sleek, pen-shaped makeup ace that has an eye pencil on one end and a smudging tool on the other. Twist the middle and there you have the perfect coordinating eye shadow ready for application. 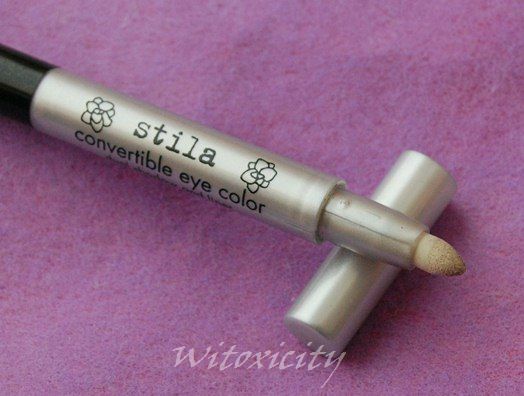 Perfect for the Stila girl who is looking for no mess, no fuss and no worry color-coordinated lids in a flash! 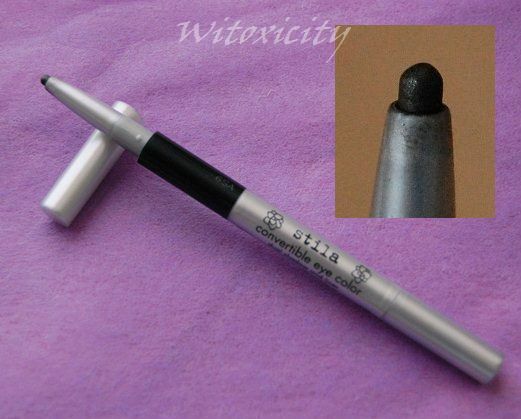 It is an eye pencil that can be twisted up and down. 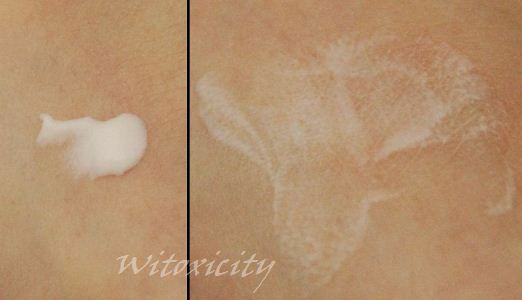 It is fairly soft, creamy and very easy to apply. So, there is little tugging involved here. 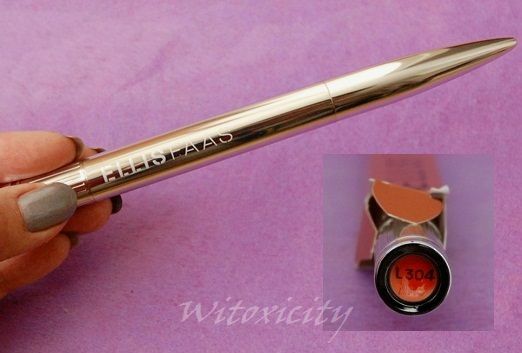 It is easily smudgable, which essentially means we're looking at an eyeliner and eyeshadow in one. It's partially waterproof, I've noticed. If it's a light application, it's easy to remove with normal eye makeup remover. 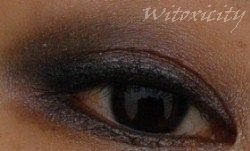 If it's thickly applied and with an eyeshadow primer as a base, it would be better to use waterproof eye makeup remover. It does crease within an hour or two but using an eyeshadow primer would delay that by about another three hours. It smudges a bit at the end of the day. 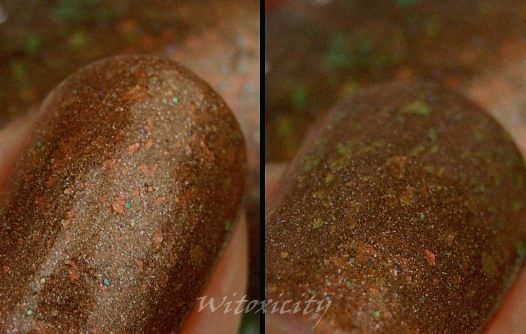 The one I have has a hint of shimmer. 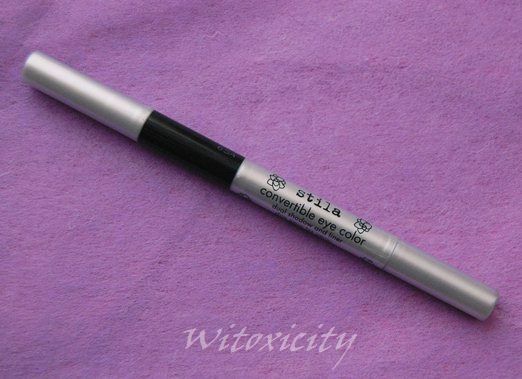 There is a reminder by Stila to always turn down the pencil portion of the pen before putting the cap back on. This would prevent breakage. This is revealed by unscrewing the middle section. 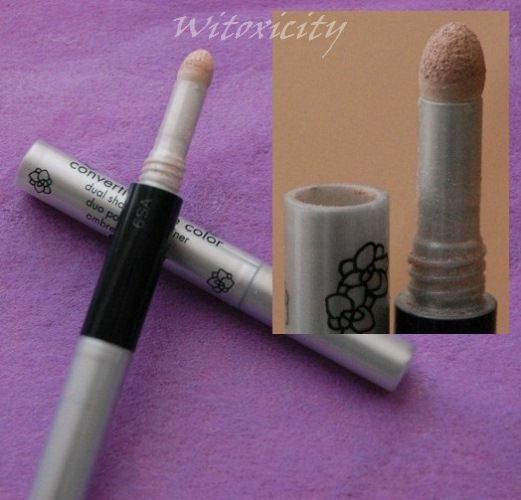 One portion has a stubby sponge applicator and the other is the well that contains the powder eyeshadow. It can be a bit messy here with eyeshadow fallout. This eyeshadow definitely needs an eyeshadow primer as otherwise, it just disappears before you even get to your lipstick. Thumbs down. It is a shimmery eyeshadow. On the oppposite end of the eyeliner, you'll find the smudging sponge. 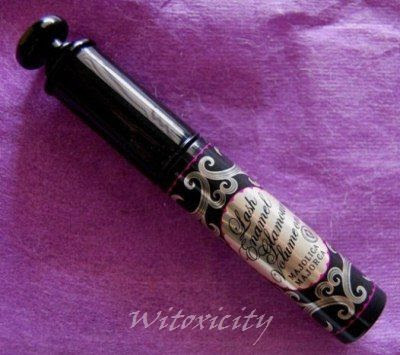 I tend to use it for its intended purpose and ocassionally, I'd use my fingers to smudge the eyeliner. 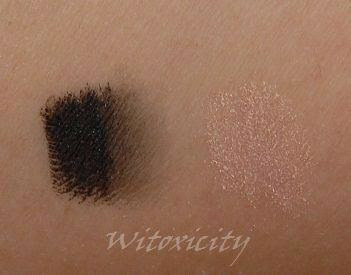 It's a decent smudger but it gets dirty very quickly from the dark colour of the eyeliner. I wash it regularly in my attempt to keep it clean (pictured is the just-washed smudger). The Convertible Eye Color feels light in the hand. The one I have is in Forest. The eyeliner portion is an olive green shade and the eyeshadow is a beige/champagne colour that takes on a golden tint on my eyes. The Stile Convertible Color wands are available in a total of ten colour combinations. 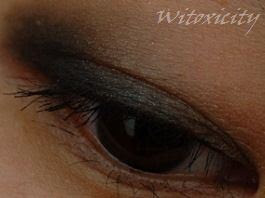 The eyeliners are dark shades and the eyeshadows are light-coloured. 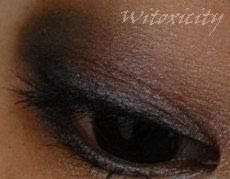 • two eyeshadows - a dark one (the eyeliner through smudging) and a light-coloured powder eyeshadow. 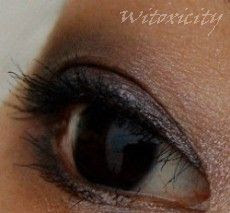 Image right: Eye look with just the eyeliner portion. I'll probably do one or two proper eye looks later with this product. 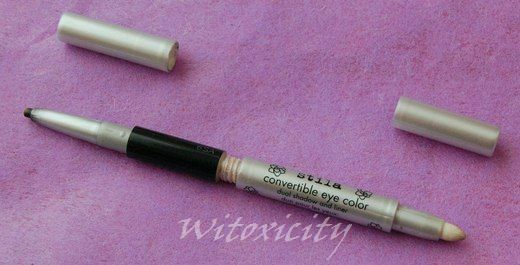 I know that after reading this, you won't want to buy this Convertible Eye Color. My personal conclusion about this product will go against the grain: Since I already have it, I might as well make the best use of it. So, despite its shortcomings, I'm won over by its versatility and convenience. 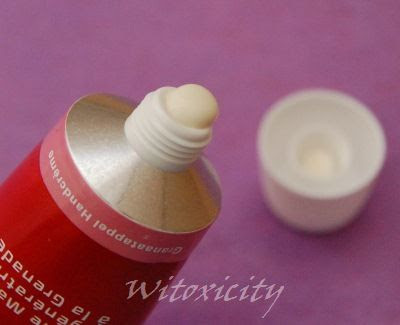 Its problems can be solved to some extent with the use of a good eyeshadow primer. There is room for improvement and well, frankly, it would be great if Stila could also include a mascara somewhere in the product! Stila products are available through websites such as ASOS, Beauty Bay and feelunique.com. 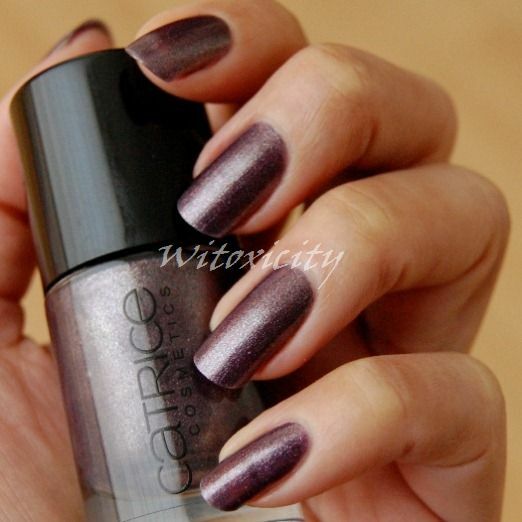 Purplelized is a relatively new polish from Catrice. 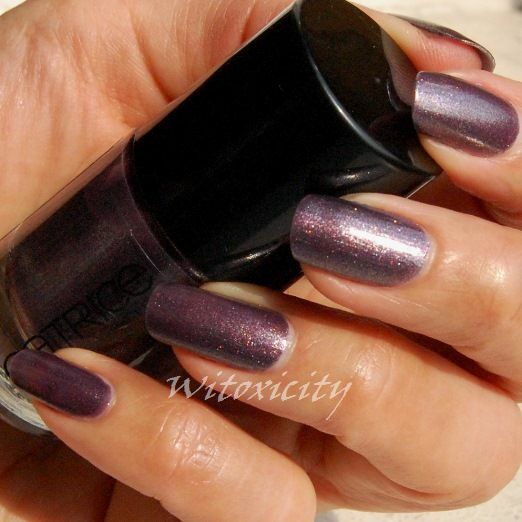 It was one of those polishes that I knew I had to have when I first saw it at Kruidvat (a Dutch drugstore chain). 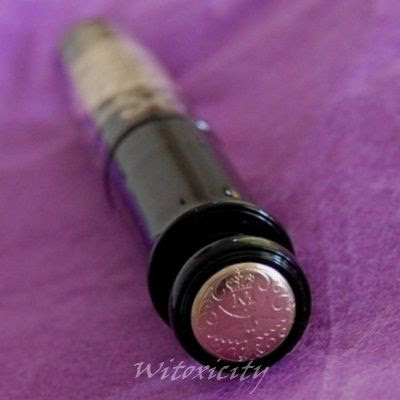 There's something very charming about the silvery purple. It imparts both a vampy vibe and a metallic-y futuristic space-age feel, me thinks. You're looking at two coats. The first two photos were taken indoors under normal lighting. In the next two photos, you can see Purplelized totally flaunting its dense silver microglitters in sunlight. Gorgeous! Application: Superb. Drying time: Fast. Durability: Average. Price: €2.49. 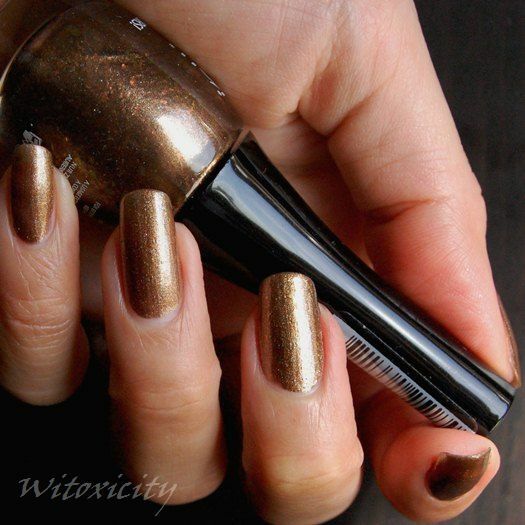 A cool, quality nail polish at a budget-friendly price. Honestly, this one really puts some high-end overpriced ones to shame. Every now and then, I like to do something unexpected. It's nice to give my readers a pleasant surprise sometimes as I truly appreciate the support. 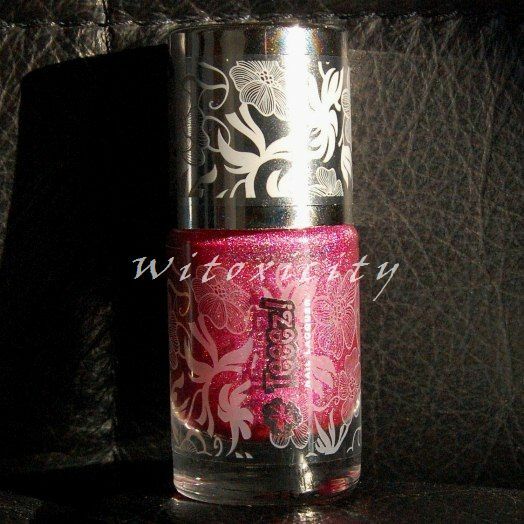 I got hold of another bottle of that berry pink holographic nail polish from Teeez, and I am giving it away to one lucky reader who left a comment on that post featuring Teeez Smooth. Congratulations, Lolipop! Lolipop, please get in touch with me (see Contact page) so that I can have your postal details. There may be other little surprises coming soon, so do be on a lookout. The ongoing Hello, Holo! 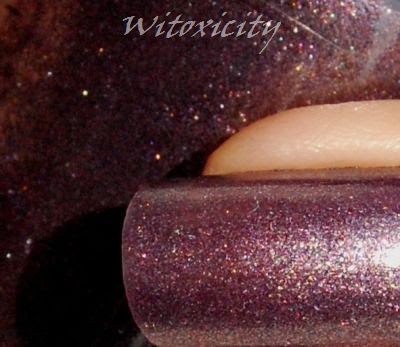 giveaway on Witoxichic, my style/photography site, also features this berry pink holo (together with a blue one). It ends 6th May. When I think of Weleda, I think natural, no mineral oils, no preservatives and biodynamic farming. 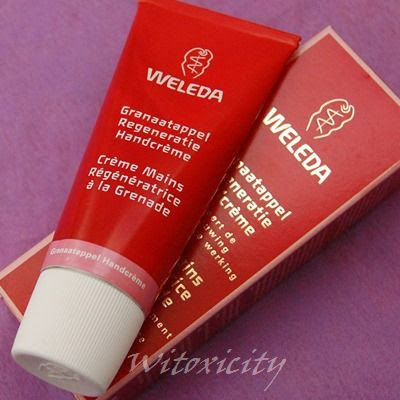 However, did you know that the main founders of Weleda were a Dutch lady doctor and an Austrian philosopher? You know I like to explore the heritage of a brand and this one on Weleda would be no exception. You may skip this section if you only want to know about the hand cream. Please note that this is more a feature than a review. The reason is given at the bottom. Weleda’s main founders: Dr Ita Wegman, a specialist in women’s medicine and Dr Rudolf Steiner, well-known philosopher and natural scientist. Both led the anthroposophical medicine movement in the early 20th century. Dr Steiner, the initiator of the science of anthroposophy, got involved in anthroposophical medicine when he started collaborating with homeopathic physicians and pharmacists. Anthroposophy is a science that covers all aspects of life, be it physical, psychological and spiritual. In anthroposophical medicine, a person is regarded holistically – body, soul and spirit – and the body is encouraged to heal itself. It was also more about maintaining health than eliminating disease. One can be treated with homeopathic and anthroposophical medicine in conjunction with conventional medicine. In 1921, Dr Wegman and Dr Steiner, together with a team of physicians and pharmacists, established a pharmaceutical laboratory in Arlesheim, Switzerland, which was also where Dr Wegman had established her anthroposophic medical clinic. There, they produced pharmaceutical products and cosmetics made of natural ingredients and this in effect marked the birth of Weleda. Veleda/Weleda was the name of a revered healing priestess and prophetess of the Bructerian nation in Germany. If they are one and the same, I wouldn’t know. 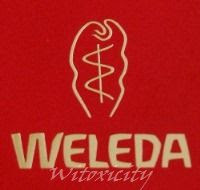 Weleda’s brand logo is a loose variant of the Rod of Asclepius, the symbol of medicine and healing. The two squiggly lines surrounding the Rod of Asclepius were said to have been Dr Steiner’s idea to symbolise enveloping protection and social interaction (give and receive, produce and consume, doctors and patients). I have been using this hand cream since late last year. Price €8.25 for a 50ml, housed in an old-fashioned metal tube. I’ve reached that age where my hands should be receiving more intensive care and so, hand creams have become my new obsession! A quick note on the state of my hands: boney and veiny (both hereditary, I’ve had that since young), quite taut, starting to develop fine lines, no age spots. Antioxidant-rich, organic pomegranate oil helps reduce the appearance of age spots and improves the firmness of your hands. 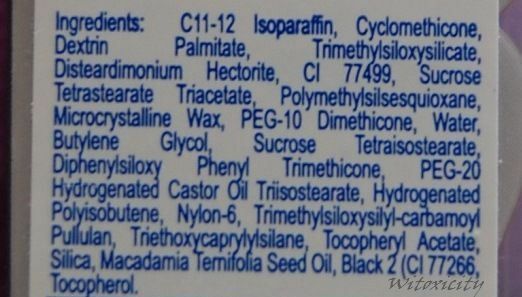 Water, Sesame Seed Oil, Glycerin, Alcohol, Glyceryl Stearate SE, Shea Butter, Sunflower Seed Oil, Stearic Acid, Pomegranate Seed Oil, Millet Seed Extract, Ruscus Aculeatus Root Extract, Sunflower Petal Extract, Avocado Oil Unsaponifiables, Olive Oil Unsaponifiables, Xanthan Gum, Fragrance *, Limonene*, Linalool*, Citronellol*, Geraniol*, Citral*, Eugenol, Coumarin*. To me, it doesn’t smell like pomegranate or sesame seed oil. It’s just a tart, slightly citrusy scent. It's neither fantastic nor disgusting. 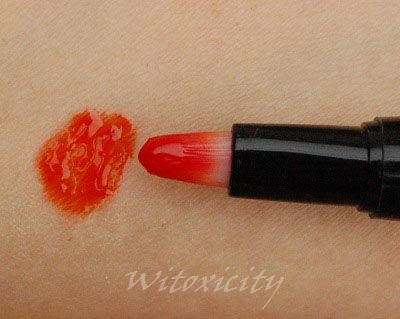 It is off-white in colour, not greasy and its consistency is quite thin, but not runny. Pretty good. I’ve been using it at bedtime (I use another hand product during the day). After massaging it in, it does take a few minutes to get absorbed into the skin, so you’d have to be a bit patient. It leaves the skin feeling a bit tacky (but not sticky) to the touch. In the morning, I do find that the skin on the back of my hands are softer, hydrated and (if my eyes are not playing tricks on me) rather glowing. I haven’t noticed any difference in the firmness of my skin or a reduction in fine lines, but that’s not to say that it hasn’t worked. I do think that such matters need to be addressed much, much later, after a few years’ use. So, I might get back to you on this in a few years’ time.......or when I reach retirement age and still writing on Witoxicity. I’ve finished my first tube and am now on to my second. Wish me luck! 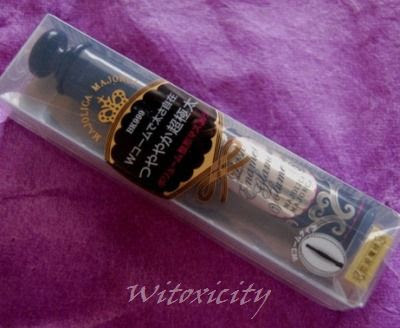 If you know of Majolica Majorca, you would surely have read about their mascaras before as they are much loved in the Far East and we're talking about Holy Grail material here. I bought this the same time as when I got the Perfect Automatic Liner, which, by the way, is a pretty good liquid eyeliner. It was bewildering to start with as there were several variants (as is often the case in mascara ra-ra land), depending on one's needs: black and thick, distinct and long, plush and full, etc. 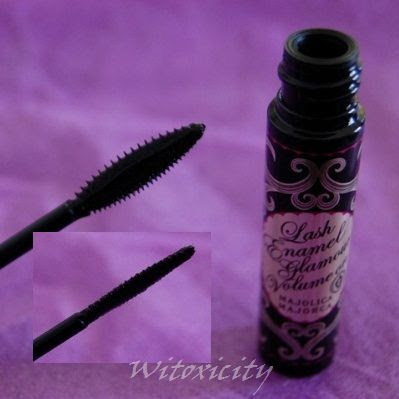 In the end, I chose Lash Enamel Glamour Volume On (for ultra-thick lashes) in Black BK999. The name is a mouthful for sure, even worse if you pre-fixed that with Majolica Majorca. You should try memorising that whole name just for fun. Ridiculously thick doll-like lashes in the two pictures, no? The other thing that I want to show you is the meh plastic packaging. It's so disproportionately meh compared to the pretty tube inside. I said almost the same thing back then with the Perfect Automatic Liner. Thicker and thicker! A revolutionary volume-lifting mascara to pump up lashes for ultimate volume. Mascara coats lashes to give a shiny jet-black finish with just one stroke! With the new double comb wand, it creates ultra thick lashes that are irresistibly doll-like! It's definitely not your usual mascara tube design. Most ladies would call it cute, some might call it ornate. I'd go for the latter. The whole tube is less than five inches long. I love the emblem on the top of the tube, unnecessary but cool. It follows on that the applicator is quite short, which allows for better application control. Definitely a thumbs up. It's a comb, not a brush. As you would have noticed, it's a double-sided paddle-shaped comb. One side is wide-toothed and the other fine-toothed. The combs are stiff-ish and they look and feel like plastic. The tapered end is good for getting at the lashes on the outer corners of the eyes. Narrow-tooth: for super-thick lashes, separates lashes, simultaneously giving volume. Wide-tooth: for extreme super-thick lashes, styles lashes from the roots for maximum volume. To be honest, despite all the superlatives, I couldn't tell the difference between the two after application. All I see is volume, length and curl with both types of combs. With the mascara on, my lashes feel natural to the touch and there is no weird stiffness. I'm not inclined to say too much about the effectiveness of Lash Enamel Glamour Volume On. The photos say it all. I've taken to applying first with the narrow-toothed comb and then with the wide-toothed side. I suppose you can consider that as two coats. If you compare the results in reality with what was shown in the brochure (see again snapshot above), it would be a disappointment. 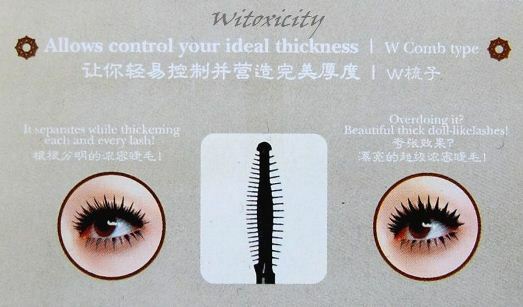 The pictures shown in the brochure have obviously been doctored (or done with false lashes). It's just not achievable in real life, in my opinion. I think I'm grounded enough not to expect that, but it's nice to hope. Cast-iron lasting. First of all, it's waterproof. Secondly, it doesn't flake. Thirdly, it holds the curl. The following images were taken seven hours apart. I've had it on for 11-12 hours before and my lashes looked almost the same as they were when I applied the mascara earlier in the day. I said "almost" as I think there was a tiny loss of curl in the lashes. That's acceptable considering that it was after more than ten hours' wear. As is typical of mascaras after a few months' use, this one has started to clump. It's obviously less fun to apply compared to the early clump-free days. Sometimes, I would just comb through my lashes with a separate brush. Of course, you'd need to use an oil-based eye makeup remover. I've read that these mascaras are a pain to remove but I thought it wasn't any worse than other waterproof mascaras. I just place a piece of cotton pad soaked with the remover on my lashes/eye and hold it there for about ten seconds. Repeat twice and then dab, dab, dab. The mascara will just dissolve. There's no need to rub, tug and pull (and curse). Fantastic mascara, if you don't allow yourself to be fooled by the unreal pictures in the brochure. It works great for fine, short and straight lashes (mine, mine and mine). Longlasting, waterproof and no flaking. What more could I ask for? This mascara retails for around the equivalent of €12. Majolica Majorca products are harder to come by outside of Asia. I got mine while on holiday there. If you're not familiar with this brand, please don't think that it's a Spanish brand. Majolica Majorca is a drugstore-category sister brand of the high-end Japanese cosmetics giant, Shiseido. Unlike Shiseido, Majolica Majorca is a girly-girly princessy brand that dwells on fairy-tales and, of course, doll-like looks. From the list of countries listed, choose eg: Singapore for the English version. The website may take a while to load. It's a smokey look today using mostly Jane Iredale products. 1. Applied eyeshadow primer (not shown). 2. Using Silver Lining: applied the taupe on the whole eyelid fold, the light grey in the inner corner and the dark grey in the outer corner. Blended. 3. Optional: Lined with the taupe of the Smudgeliner Armour. 4. 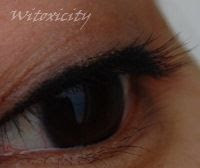 Tightlined with the black/grey of the Jane Iredale Eye Pencil. 5. Applied a thick line with the taupe of Silver Lining. 6. Over that, applied a thinner line with the dark grey of Silver Lining. 7. Lined close to the lashes with the taupe of Smudgeliner Armour. 8. 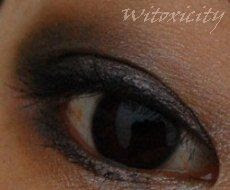 Optional: Used the white end of the Eye Highlighter Pencil on the inner quarter of the lower lid. 9. Curled lashes and applied mascara. 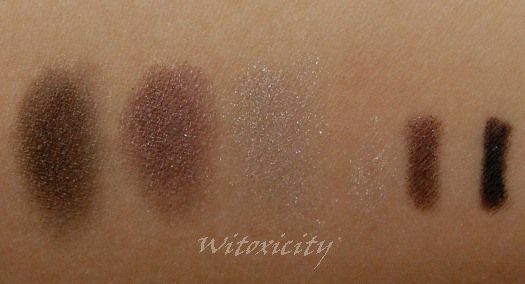 As mentioned, the eyeshadow trio is composed of these powder shadows: a dark grey, a taupe and a light grey with subtle shimmer. May Contain: Titanium Dioxide, Iron Oxides, Carmine, Manganese Violet, Ultramarines, Chromium Oxide Greens. The shadows applied silky smooth. The pigmentation is so-so, I thought, and you'll definitely need a primer. I have yet to try applying it wet. 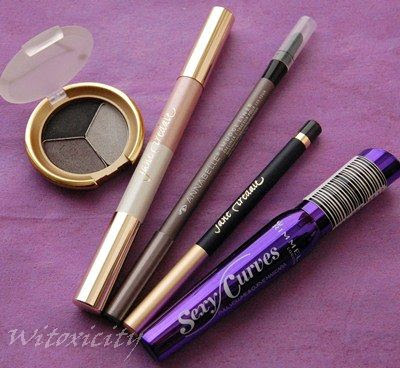 It's good that there isn't much eyeshadow fallout though, and I really like the sturdy, chique clamshell casing. 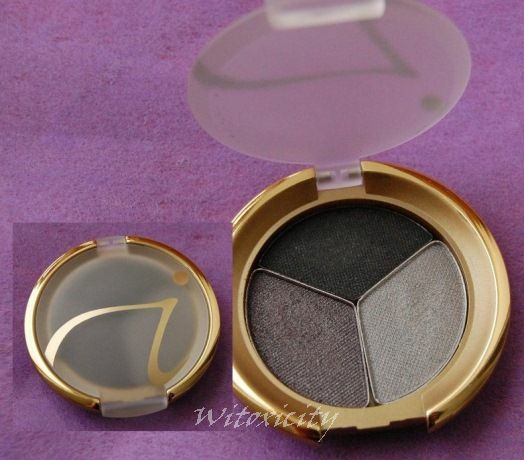 The Jane Iredale PurePressed Triple Eye Shadow also comes in ten other colour combinations, some more interesting than others. Individually, they retail for USD27 (for 2.8g). I got mine in a kit, which worked out to be a much, much better deal. 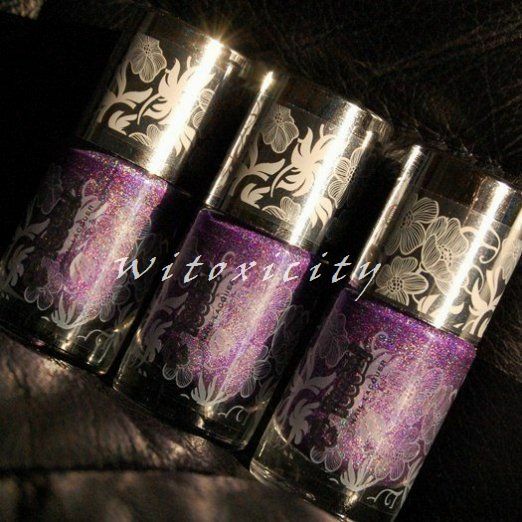 One of the most common questions I get asked by my international readers is "Where can I buy KOH nail polish?". 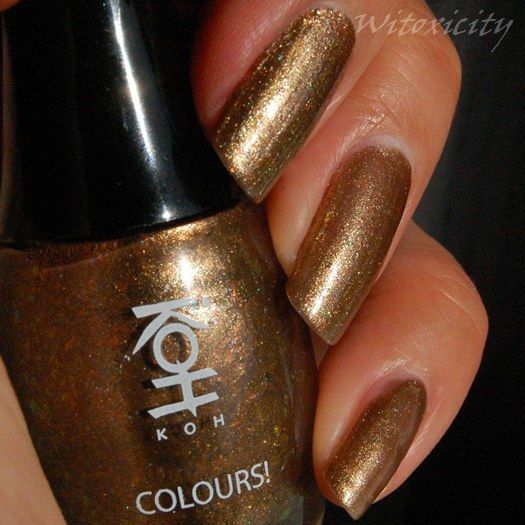 KOH is a Dutch brand that is mainly known for its wide range of nail polish colours. 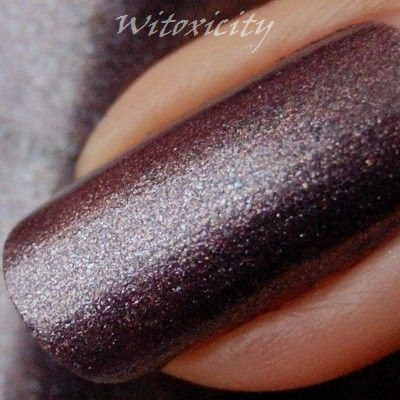 I thought I'd write a post with guidelines on buying KOH nail polishes. Hopefully, it will give anyone who might be interested a clearer picture. 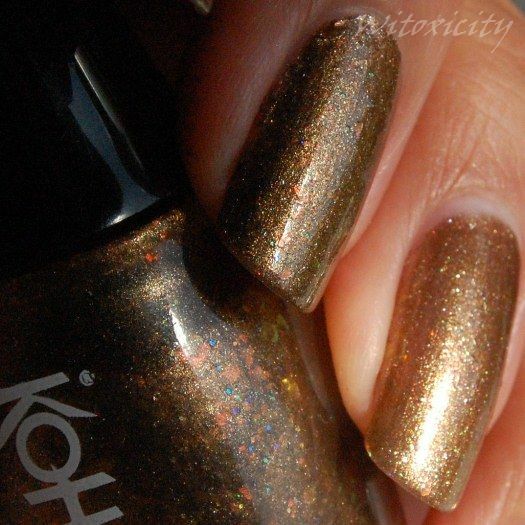 Note: In the Netherlands, the recommended retail price for a 10ml bottle of KOH nail polish is €14.95. This is a long-winded article, so please feel free to scroll down to the appropriate section. This is KOH's flagship store and it is, at the moment, the one and only dedicated KOH store in existence. For months, there has been talk of opening new KOH shops in de Bijenkorf in other cities but to-date, none have come into fruition. Because it is the only one around and is managed directly by KOH, the KOH Experience Shop in Amsterdam is the best place to go to for your KOH needs. There, you can get your manicure done by trained staff but more importantly, the shop has basically the entire KOH product range in its offering - nail products and bodycare products. The KOH Experience Shop gets a facelift every few months, which is very hard to keep up with. It is on the 2nd Floor of the Dutch upmarket departmental store, de Bijenkorf. de Bijenkorf is located within walking distance (under ten minutes) from the Amsterdam Central Train Station. There is now a second KOH Experience Shop and it is in de Bijenkorf in the city of Eindhoven. That's the Nail Polish Heaven for you. If you have the chance, do pay it a visit one day, if only to check out their Wall of Joyful Colours. In the Netherlands, parfumerie stores are where you would go to to buy mid-range to high-end cosmetics, including the classical brands. KOH is available in some parfumerie chains. The size of the KOH product offering at these parfumerie stores vary depending on the size and location of the stores. Some stock just a selection of KOH Colours (the nail polishes) while the bigger stores with heavier foot traffic may have the full range (though it's usually never as complete as what you'd see at the KOH Experience Shop in de Bijenkorf). Mooi is a fairly new but fast expanding parfumerie chain. The stores are usually not very big. Some Mooi stores may have a wider range of KOH products than others. Douglas is an old establishment and has stores all over the country. Standards and size of the KOH product offering differ from store to store. Some have only a small rack tucked away in a corner, with perhaps 20 nail polish colours (bear in mind that KOH has easily more than 120 colours in its range). Some bottles are improperly placed, like a colour from the permanent collection being put in the Limited Edition section. Sometimes, the rack and the bottles are dusty, hinting at neglect and sluggish stock movement of KOH. The big Douglas stores (usually in the city centre) tend to have better and more respectable display areas and offer a wider range of KOH products. This is a very common parfumerie chain in the Netherlands. 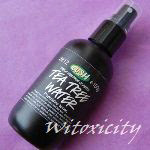 However, there is no need to go looking for KOH products there. ICI Paris no longer stocks KOH. There are many other smaller parfumeries stores that sell KOH products. It is best to view the complete list of stores in the Netherlands on the KOH website. 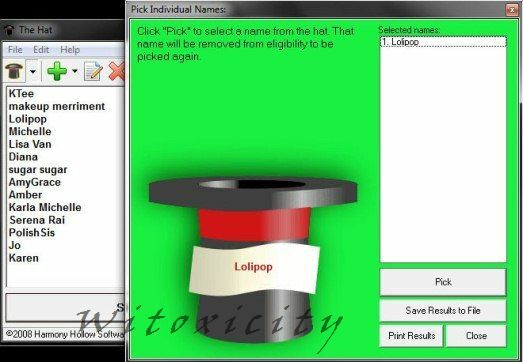 Updated 16 July 2012: This information is currently not available on the new KOH website. My previous feature: parfumerie stores in the Netherlands. Updated 16 July 2012: This information is currently not available on the new KOH website. KOH is sold in Italy but there is no information on the sales points yet on the website. This is perhaps more relevant to most of my international readers who are interested in procuring KOH products. There were shipping restrictions previously but now, it is possible to purchase KOH products online and they do ship internationally. So, if you live in the United Kingdom, United States, Brazil or the Philippines, for example, it is actually possible to place an order for KOH nail polishes directly from their website. However, ridiculous as it seems, KOH has unfortunately overlooked one very important issue: Not everybody understands Dutch. Please see update below. When you first visit the KOH website, you would be presented with different language options: English, Dutch, German, French, Spanish, Italian and Japanese. Its online shop is, guess what, located within the Dutch website. While it made sense in the early days when KOH was small and less well-known internationally, it is certainly a huge oversight on their part now that they do offer worldwide shipping. Tsk, tsk, tsk. I wouldn't know if they are working on revamping their website but at the moment, I'm just telling you the situation as it is. The section where you will find the online shop is called KOH For You. Please see update below. If you would like to place an order, I think you won't have big problems navigating the online shop. You can easily go by the product names and images and click through. As far as I know, international customers can pay through Paypal. At some stage, you will be asked to fill in your information: Name, Salutation, Streetname (not house no. ), House No., Postcode, City, (choose) Country, Telephone No., Email address, Notes/comment. You can check on Google if you're not sure. If you encounter any problems, please contact KOH directly. This information has been kindly provided by a reader in the US who placed an online order on the KOH website in May. Payment is via Paypal, hence the procedure is pretty much standard once a customer logs into Paypal. After a customer has paid for the order, there is apparently no receipt or email from KOH to confirm the items ordered and the payment made. The customer would however receive the standard payment confirmation from Paypal. If you are particularly concerned about this after placing your order, I suggest writing an email to KOH Customer Service for a confirmation and to find out when the package is shipped. An order takes approximately two weeks to reach an address in the US. Good news! The KOH website has been revamped and is now also available in the English language. KOH products are now also available through Zalando, which is a kind of Asos for continental Europe, I suppose. However, Zalando charges €19.95 per bottle of KOH nail polish. If you live in the Netherlands, you would be out of your mind to order KOH nail polishes through Zalando. You are in effect overpaying by €5.00! I don't know why they are overcharging by so much and besides, it has the most useless descriptions for the KOH nail polishes. 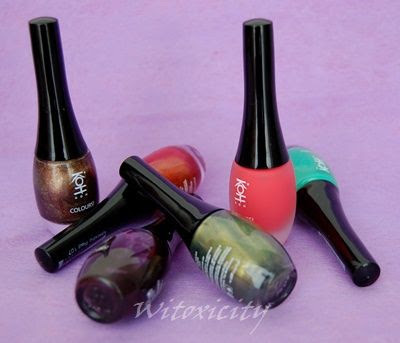 (At time of writing) For all the KOH polishes, their names are just Red, Blue, Grey, Green, Silver, etc. The actual proper full names of the individual polishes are not given, so how does Zalando expect customers to know exactly which KOH polish they are buying? Go figure! 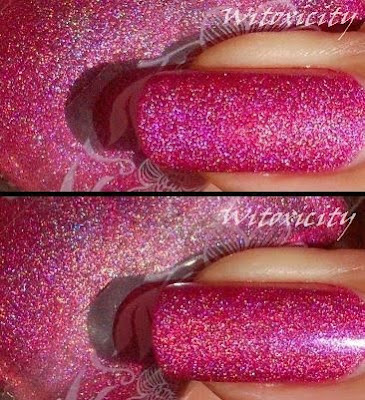 KOH polishes also have numbers and even the numbers are not indicated by Zalando. I rest my case. Zalando Netherlands has wisely corrected the oversight. The website now shows the appropriate names of the KOH nail polishes. They are still overcharging for these polishes though. Ditto for Zalando France. I don't know how much KOH nail polishes normally retail for in France but on the Zalando site, they retail for €19.95 per bottle. Colour descriptions are also useless. Zalando France has also corrected the oversight. 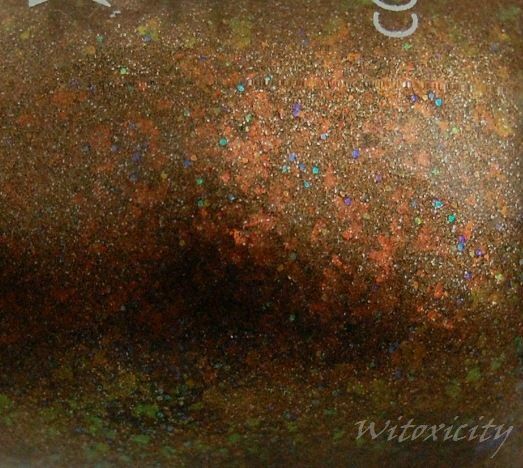 The website now shows the appropriate names of the KOH nail polishes. Again, KOH nail polishes retail here for €19.95 and €19.50 per bottle respectively. 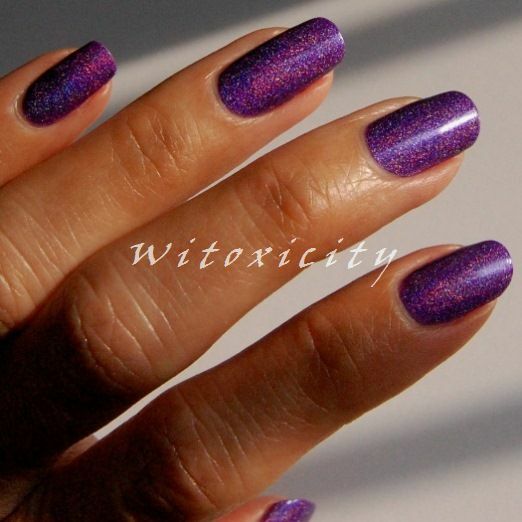 However, Zalando Germany and Zalando Austria have wisely used the actual names of the polishes. Zalando UK now offers beauty products on its website, which means that readers in the UK can now easily buy KOH products through Zalando UK. On this website, KOH nail polishes retail for £17.95, which is roughly the abovementioned jacked-up price of €19.95 converted to £s. The Douglas Parfumerie online stores in the Netherlands and Germany also carry the KOH range of products. The range shown on the Dutch website appears limited (price: €14.95) but the one for Germany seems to have a fairly wide range (€19.50). These are the online shops that I know of that sell KOH nail polishes. There may be others that I am not aware of. 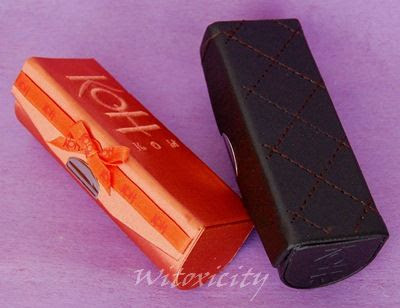 If you are familiar with KOH, you would know that every bottle of KOH nail polish has always come with an elegant case that looks like an oversized lipstick case. As far as I know, they still supply the cases. The design varies from season to season. In the past, I have heard of instances where ladies were not given the accompanying KOH case with their purchase of KOH nail polish. This happened to customers who were probably new to the brand and didn't know about the cases and it usually happens in smaller parfumerie stores. I don't know if the ignorance of the sales staff is real or feigned. I've experienced this myself - twice - at different smaller parfumerie stores and I had to remind them about the case. This however has never happened at the KOH Experience Shop - the staff know what they are doing. 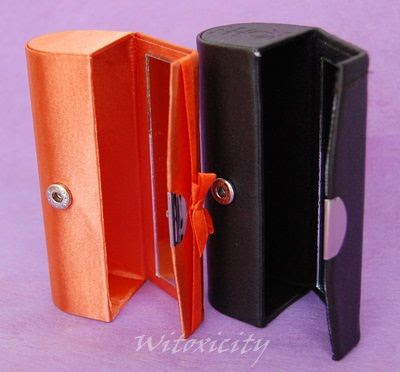 I've also noticed that the smaller parfumerie stores may not always have the cases with the very latest designs. You may or may not mind getting one from a couple of seasons before. So, this is just a reminder for whenever you buy KOH nail polishes. If the sales staff forgets, please remind him/her. You are, after all, entitled to the case. I think I've pretty much covered all that's important. I sincerely hope some of you will find these guidelines helpful. I have written this article on my own initiative for the benefit of my readers. I have not been asked or paid by KOH to write this guide. As mentioned earlier, I get many questions from my international readers on this and as one who lives in the home country of KOH, I thought I'd share some information and tips on buying KOH nail polishes. Please feel free to click on the links to KOH's website. I earn no commissions from them. If you have any further questions, it would be best to check with KOH Cosmetics directly.